We Bare Bears is about three brothers trying to fit in and make friends...which can be kind of hard to do when you’re a bear. Grizzly (Eric Edelstein), Panda (Bobby Moynihan) and Ice Bear (Demetri Martin) are fairly savvy about the modern world: they’re masters of the selfie, fans of the food truck, and chasers of Internet fame. Yet, they have a lot to learn about the trendy residents that surround their humble Bay Area cave. Grizzly, the oldest bear, will lead his younger brothers, Panda and Ice Bear, with endless optimism that will only result in disaster, some of the time. The Bears’ favorite way to get around town is by#bearstack, where Grizzly stands atop Panda who stands atop Ice Bear who walks them wherever they want to go. 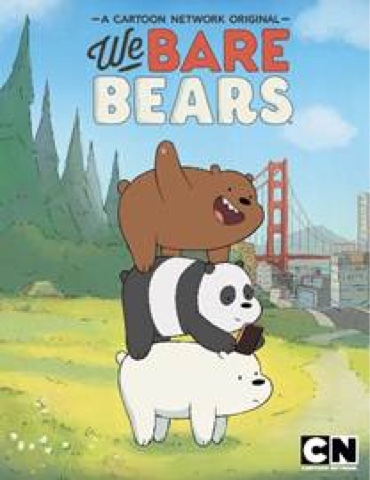 Along the way, the Bears are joined by their best human friend Chloe (Charlyne Yi), a fame-flaunting Koala named Nom Nom (Patton Oswalt), and their neighbor Charlie (Jason Lee), a.k.a. Bigfoot. Ellie Kemper will also guest star this season. Created by Annie Award-winner Daniel Chong (Toy Story of Terror! ), We Bare Bears was developed as part of Cartoon Network Studios’ global, award-winning shorts program where its original short won the “Young Amsterdam Audience Award” in 2014 at the prestigious KLIK! Amsterdam Animation Festival. The show joins a list of other successful series developed out of the program including Cartoon Network’s current hits, Steven Universe, Uncle Grandpa, Clarence, and the Emmy®-winning Regular Show—all part of the network’s line-up of #1 timeslot hits lead by the Peabody Award winning Adventure Timeand fan-favorite Teen Titans Go!